Editor’s note: Aileen Lee is founder of Cowboy Ventures, a seed-stage fund that backs entrepreneurs reinventing work and personal life through software. Previously, she joined Kleiner Perkins Caufield & Byers in 1999 and was also founding CEO of digital media company RMG Networks, backed by KPCB. Follow her on Twitter @aileenlee. Many entrepreneurs, and the venture investors who back them, seek to build billion-dollar companies. So, we wondered, as we’re a year into our new fund (which doesn’t need to back billion-dollar companies to succeed, but hey, we like to learn): how likely is it for a startup to achieve a billion-dollar valuation? Is there anything we can learn from the mega hits of the past decade, like Facebook, LinkedIn and Workday? To answer these questions, the Cowboy Ventures team built a dataset of U.S.-based tech companies started since January 2003 and most recently valued at $1 billion by private or public markets. We call it our “Learning Project,” and it’s ongoing. We found 39 companies belong to what we call the “Unicorn Club” (by our definition, U.S.-based software companies started since 2003 and valued at over $1 billion by public or private market investors). That’s about .07 percent of venture-backed consumer and enterprise software startups. On average, four unicorns were born per year in the past decade, with Facebook being the breakout “super-unicorn” (worth >$100 billion). 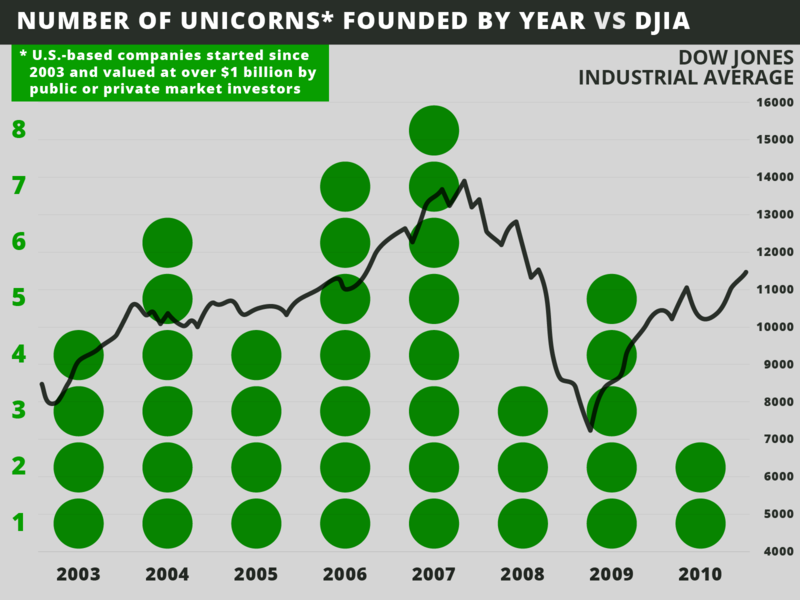 In each recent decade, 1-3 super unicorns have been born. 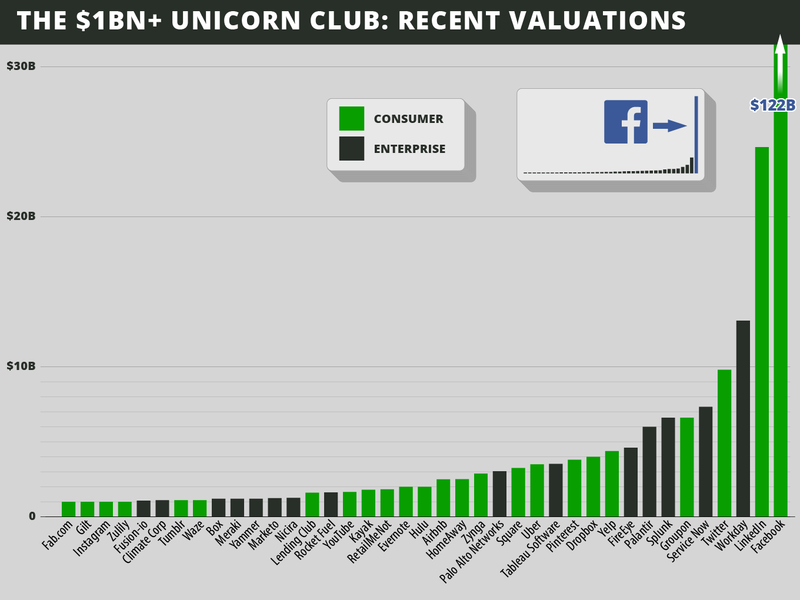 Consumer-oriented unicorns have been more plentiful and created more value in aggregate, even excluding Facebook. Companies fall somewhat evenly into four major business models: consumer e-commerce, consumer audience, software-as-a-service, and enterprise software. It has taken seven-plus years on average before a “liquidity event” for companies, not including the third of our list that is still private. It’s a long journey beyond vesting periods. The “big pivot” after starting with a different initial product is an outlier. San Francisco (not the Valley) now reigns as the home of unicorns. There is very little diversity among founders in the Unicorn Club. Figuring out the denominator to unicorn probability is hard. The NVCA says over 16,000 internet-related companies were funded since 2003; Mattermark says 12,291 in the past 2 years; and the CVR says 10-15,000 software companies are seeded each year. So let’s say 60,000 software and internet companies were funded in the past decade. That would mean .07 percent have become unicorns. Or, 1 in every 1,538. Takeaway: it’s really hard, and highly unlikely, to build or invest in a billion dollar company. The tech news may make it seem like there’s a winner being born every minute — but the reality is, the odds are somewhere between catching a foul ball at an MLB game and being struck by lightning in one’s lifetime. Or, more than 100x harder than getting into Stanford. That said, these 39 companies have shown it’s possible – and they do offer a lot that can be learned from. Prior decades have also given birth to tech super-unicorns. The 1990s gave birth to Google, currently worth nearly 3x Facebook; and Amazon, worth ~ $160 billion. The 1980’s: Cisco. The 1970s: Apple (currently the most valuable company in the world), Oracle, and Microsoft; and Intel was founded in the 1960s. What do super-unicorns have in common? The 1960s marked the era of the semiconductor; the 1970s, the birth of the personal computer; the 1980s, a new networked world; the 1990s, the dawn of the modern Internet; and in the 2000s, new social networks were built. Each major wave of technology innovation has given rise to one or more super-unicorns — companies that could change your life to work at or invest in, if you’re not lucky/genius enough to be a co-founder. This leads to more questions. What is the fundamental technology change of the next decade (mobile? ); and will a new super-unicorn or two be born as a result? The 38 companies on our list outside of Facebook are worth about $3.6 billion on average. This might feel like a letdown after reading about super-unicorns, but remember, startups generally start as ideas that most people think are crazy, dumb, or not that important (remember when people ridiculed Twitter as the place to share that you were eating a ham sandwich?). Only after many years and extraordinary good fortune, a few grow into unicorns, which is extremely rare and pretty awesome. Unicorn founding was not front-end-loaded in the past decade. The best year was 2007 (8 of 36); the fewest were born in 2003, 2005 and 2008 (as far as we know today; there are none yet founded in 2011 to today). From this snapshot in time, it’s not clear whether the number of unicorns per year is changing over time. It would be interesting to plot the trajectory of unicorns over time — which become more valuable and which fall off the list — and to understand the list of potential unicorns-in-waiting, currently valued at <$1 billion. Hopefully for a future post. Three consumer companies — Facebook, Google and Amazon — have been the super-unicorns of the past two decades. There are more consumer-oriented than enterprise unicorns, and they have generated more than 60 percent of the aggregate value on our list outside of Facebook. Our list likely seriously underestimates the value of consumer tech. Of the 14 still-private companies on our list, 85 percent are consumer-oriented (e.g. Twitter, Pinterest, Zulily). They should see a significant step up in value if/when a liquidity event occurs, increasing the aggregate value of the consumer unicorns. One reason why enterprise ventures seem so attractive right now: the average enterprise-oriented unicorn on our list raised on average $138 million in the private markets – and they are currently worth 26x their private capital raised to date. The companies that seriously improved this metric are Nicira, Splunk and Tableau, who all raised <$50 million in private markets and are worth $3.8 billion today on average. Plus Workday, ServiceNow and FireEye who are currently worth >60x the private capital raised. Wow. Contrary to conventional VC wisdom about enterprise companies requiring more early-stage capital, we didn’t see a difference in Series A dollars raised by enterprise versus consumer unicorns. The consumer unicorns have raised $348 million on average, ~2.5x more private capital than enterprise unicorns; and they are worth about 11x the private capital raised. Companies who raised lots of private money relative to their most recent valuation are Fab, Gilt Groupe, Groupon, HomeAway and Zynga. It may just take more capital to build a super successful consumer tech company in a “get big fast” world; and/or, founders and investors are guilty of over-capitalizing consumer Internet companies at too-high valuations in the past decade, driving lower returns for consumer tech investors. We categorized companies into four business models, which share fairly equally in driving value in aggregate: 1) E-commerce: the consumer pays for goods or services (11 companies); 2) Audience: free for consumers, monetization through ads or leads (11 companies); 3) SaaS: Users pay (often via a “freemium” model) for cloud-based software (7 companies); and 4) Enterprise: Companies pay for larger scale software (10 companies). None of the e-commerce companies on our list hold physical inventory as a key part of their business models. Despite that, e-commerce companies raised the most private dollars on average — delivering the lowest valuations vs capital raised, and likely driving the recent cool down in e-commerce investing. Only four of the 38 companies are mobile-first. Not surprising, the iPhone was only launched in 2007 and the first Android device in 2008. Another characteristic almost half of the companies on our list share: network effects. Network effects in the social age can help companies scale users dramatically, seriously reducing capital requirements (YouTube and Instagram) and/or increasing valuations quickly (Facebook). 14 of the companies on our list are still private, which will increase the average time to liquidity to eight-plus years. The companies on our list were generally not founded by inexperienced, first-time entrepreneurs. The average age on our list of founders at founding is 34. Yes, the founders of Facebook were on average 20 when it was founded; but the founders of LinkedIn, the second-most valuable company on our list, were 36 on average; and the founders of Workday, the third-most valuable, were 52 years old on average. Audience-driven companies like Facebook, Twitter and Tumblr have the youngest founders, with an average age at founding of 30 (seemingly imminent unicorn Snapchat will lower this average). SaaS and e-commerce founders averaged aged 35 and 36; enterprise software founders were 38 on average at founding. A supermajority (35) of the unicorns on our list have chosen to blaze trails with more than one founder — with three co-founders on average. The role of co-founders varies from Co-CEOs (Workday) to technical co-founders who live in a different country (Fab.com). Looking at co-founder equity stakes at liquidity might be another interesting way to look at founder status, which we have not done. Teams that worked together have driven more value per company than those who went to school together. Only four teams of co-founders didn’t have common work or school experience, but all had a common thread. Two were known and introduced by the investors at founding/funding; one team was friends in the local tech scene; and one team met while working on similar ideas. That said, the four unicorns with sole founders (ServiceNow, FireEye, RetailMeNot, Tumblr — half enterprise, half consumer) have all had liquidity events and are worth more on average than companies with co-founders. An impressive 76 percent of founding CEOs led their companies to a liquidity event, and 69 percent are still CEO of their company, many as public company CEOs. This says a lot about these founders in terms of their long-term vision, commitment and their capability to scale from almost nothing in terms of money, product, and people, to their current unicorn company status. That said, 31 percent of companies did make a CEO change along the way; and those companies are worth more on average. One reason: about 40 percent of the enterprise companies made a CEO change (versus 25 percent of consumer companies). And all CEO changes prior to a liquidity event were at enterprise companies that added seasoned, “brand-name” leaders to their helms prior to being bought or going public. 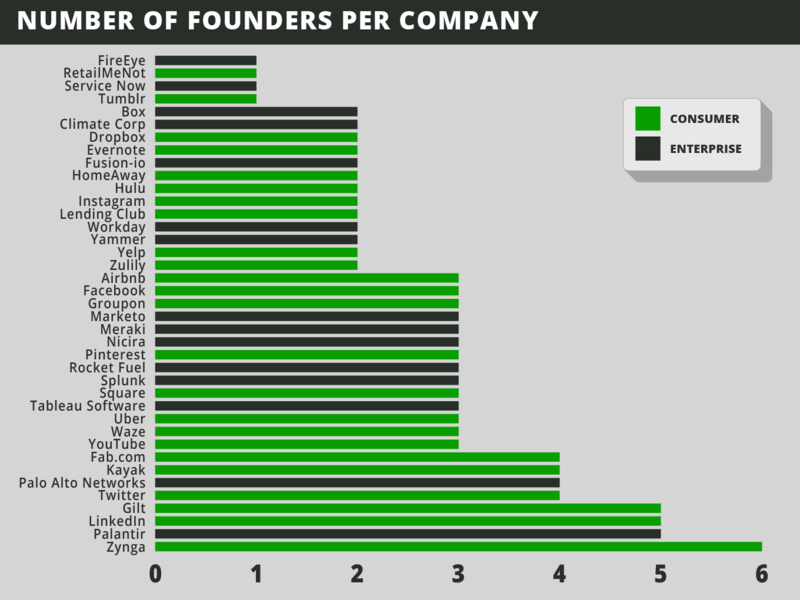 Only half of the companies on our list show all original founders still working in the company. On average, 2 of 3 co-founders remain. Nearly 80 percent of unicorns had at least one co-founder who had previously founded a company of some sort. Some founders showed their entrepreneurial DNA as early as junior high. The list of prior startups co-founded spans failure and success; and from tutoring and bagel delivery companies, to PayPal and Twitter. All but two companies had founders with prior experience working in tech/software; and only three of 38 did not have a technical co-founder on board (HomeAway and RetailMeNot, founded as industry rollups; and Box, founded in college). The majority of founding CEOs, and 90 percent of enterprise CEOs have technical degrees from college. Stanford leads the roster with an impressive one-third of the companies having at least one Stanford grad as a co-founder. Former Harvard students are co-founders in eight of 38 unicorns; Berkeley in five; and MIT grads in four of the 38 companies. Conversely, eight companies had a college dropout as a co-founder. And three out of five of the most valuable companies (Facebook, Twitter and ServiceNow) on our list were or are led by college dropouts, although dropouts with tech-company experience, with the exception of Facebook. Few companies are the result of a successful pivot. Nearly 90 percent of companies are working on their original product vision. The four “pivots” after a different initial product were all in consumer companies (Groupon, Instagram, Pinterest and Fab). Probably not a surprise, but 27 of 39 on our list are based in the Bay Area. What might be a surprise is how much the center of gravity has moved to San Francisco from the Valley: 15 unicorns are headquartered in San Francisco; 11 are on the Peninsula; and one is in the East Bay. New York City has emerged as the No. 2 city for unicorns, home to three. Seattle (2) and Austin (2) are the next most-concentrated cities for unicorns. Only two companies have female co-founders: Gilt Groupe and Fab, both consumer e-commerce. And no unicorns have female founding CEOs. While there is some ethnic diversity on founding teams, the diversity of founders in the unicorn club is far from the diversity of college grads with relevant technical degrees. Feels like some important records to break. For those aspiring to found, work at, or invest in future unicorns, it still means anything is possible. All these companies are technically outliers: they are the top .07 percent. As such, we don’t think this provides a unicorn-hunting investor checklist, i.e. 34-year-old male ex-PayPal-ers with Stanford degrees, one who founded a software startup in junior high, where should we sign? That said, it surprised us how much the unicorn club has in common. In some cases, 90 percent in common, such as enterprise founder/CEOs with technical degrees; companies with 2+ co-founders who worked or went to school together; companies whose founders had prior tech startup experience; and whose founders were in their 30s or older. It is also good to be reminded that most successful startups take a lot of time and commitment to break out. While vesting periods are usually four years, the most valuable startups will take at least eight years before a “liquidity event,” and most founders and CEOs will stay in their companies beyond such an event. Unicorns also tend to raise a lot of capital over time — way beyond the Series A. So these founding teams had the ability to share a compelling company vision over many years and rounds of fundraising, plus scale themselves and recruit teams, despite economic ups and downs. We tip our hats to these 39 companies that have delighted millions of customers with fantastic products and generated so much value in just 10 years despite a crowded startup environment. They are the lucky/genius few of the Unicorn Club – and we look forward to learning about (and meeting) those who will break into this elite group next. * Many thanks to the Cowboy crew who helped with this, including Noah Lichtenstein, Meg He, Lauren Kolodny, Kim Stromberg and Jennifer Gee. ***** Our definition of “top 10 school” is according to US News & World Report.